I'm over a month into my aerial lessons and have been experiencing many of the typical beginner aerial effects. The other day, I noticed that my outer legs and lower back were so full of bruises that I looked like a cheetah. It surprised me at first then I remembered that when I'd began pole dancing, I experienced the same effect. (This is where that previous blog about Epsom Salts comes in handy.) Bruising comes with the territory in the aerial arts. It's inevitable. When working with an apparatus such as a pole or the fabric, your body will experience trauma in the areas of contact where pressure is forcefully applied. In the case of a beginner, force is typically applied in every area of contact with the apparatus. Over time, after my body began to get used to the pole, the bruises were less severe and rarely ever evident unless I'd had an intense work out with new tricks. I am hoping that this is true with fabric too. Only time and experience will be the determining truth here. Another remedy aside from Epsom Salt that I have tried to alleviate unsightly bruises is the use of Arnica gel. I personally have not seen a reduction in the severity of bruising with the use of this therefore I am not a good resource for this product. However, I know people that use this product and have had positive experiences so it was worth mentioning here in case someone is searching for some bruise relief alternatives. I can honestly say I used this during a period where I began intensely training so the occasional bruise was over shadowed by a time when I could have easily passed for a giant human bruise. I have since come to terms with my bruises and accepted that they are going to be there as a result of my activities and trying to cover them up will be rendered useless at this point. Another long forgotten beginner experience I have been revisited with is hand soreness. I'm not sure how much of this is related primarily to the fabric and the fact that one must rely on their grip for every movement or being related to a family history of Rheumatoid Arthritis with early onset, but I have noticed the joints in my hands to have a lingering soreness lately. This hand soreness is often experienced with beginners in pole dancing. 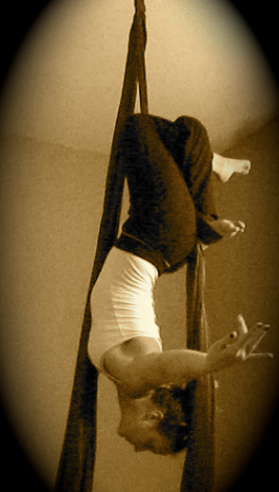 When beginning pole, a student often grips the pole with such intensity that their hands feel the effects for days later. It's often unnoticed until you actually experience the post death grip soreness. As you are learning a new maneuver it is only natural you want to have a strong grip on the pole. Bringing this to a student's attention often helps alleviate this problem and one can adjust their grip based on what they are doing with the pole. Simple beginner dance moves do not need an intense grip. To help relieve the tension built up in the hands from over gripping, one can perform hand exercises and stretches. I find using a regular tennis ball helps a lot. You can also purchase a Trigger Point Massage Ball if you find your tennis ball losing it's shape when you're applying pressure during your work outs. I prefer a high pressure massage and know all too well the benefits of utilizing a simple tennis ball in my post work out therapy in addition to my Epsom Salt soaks. Getting into a post work out regimen of pampering your body is a great habit to implement. It's a welcomed treat for your body that has a multitude of healthy benefits that you will enjoy for a healthier you for years to come.